Please join us Thursday, Feb. 12 for a day trip to Aguas Calientes and Finca La Libertad. Once again, we will meet at the cemetery in San Vito to consolidate car pooling. Please be there no later than 8:15 am. Rufous-tailed Hummingbird in flight. Photo by Julie Girard. Our first stop will be Aguas Calientes, a natural thermal pool near Gutierrez Braun on the way to Amistad Park. We will bird around the entrance and along the path to the pool. In the past we have seen many species of migrants there including American Redstarts, Ovenbirds, Black-and-white warblers, Kentucky Warblers, Northern Waterthrushes plus local hummingbirds and Sulphur-winged Parakeets. Please bring bathing suits and a towel if you’d like to take a dip in the pool! We’ll travel from there to Finca La Libertad, a working farm belonging to the Barrantes family where we will have a tour of the fruit orchard and vegetable garden and do some birding on the forest edge. A tasty Tico lunch will be provided while we feast our eyes on the beautiful Talamanca Mountains. At $25 per person, a minimum of six people will be needed to run the trip with a maximum of 12 as space is somewhat limited at the pool. Please let us know ASAP if you would like to attend by sending an email to: sanvitobirdclub@gmail.com First come, first served! This adventure is for members only so if you would like to participate but have not paid your dues for 2015, please bring them with you! Hope to see you there! 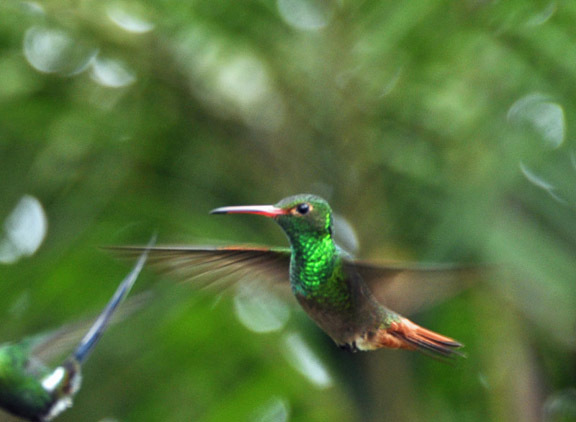 This entry was posted in Special Events and tagged Aguas Calientes, Birding in San Vito Costa Rica, Finca La Libertad, Rufous-tailed Hummingbird, San Vito Bird Club Day Trip by AWOlivieri. Bookmark the permalink.